Thank you, to all our guests who have helped to contribute to the success of Porto Azzurro this far. As a token of appreciation, we offer a 10% discount to all our Returning Guests, when booking directly with us. All you have to do is, print and show the voucher (attached) at the reception and get the 10% discount on your next stay. We will adjust your total accordingly. Contact us! For online reservation assistance call on (+356) 2158 5171. To find answers to the most common hotel questions, click here: Q&A. 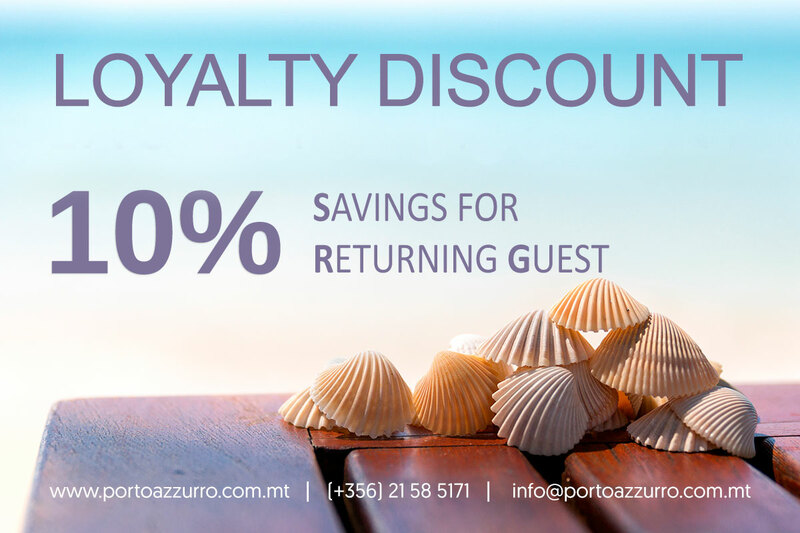 For further inquiries about your direct booking benefits, click here, or, send us an email at info@portoazzurro.com.mt.